I recently had the honor of hosting my now sister-in-law’s bridal shower and at the request of my mother, I have decided to share it. Now I am not going to post the recipes per-say, but I hope this is helpful for a little mini-appetizer inspiration for anyone hosting something similar in the future! 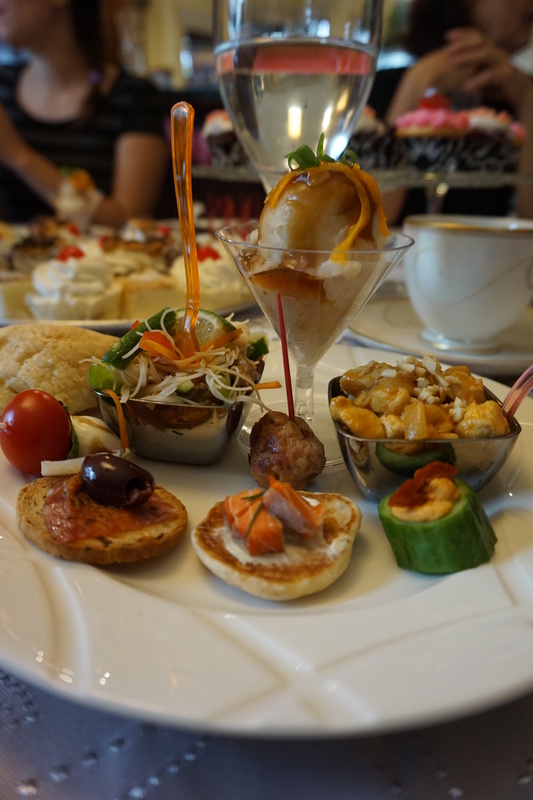 I was lucky enough to have someone else looking after the dessert portion, and someone else bringing some cheesy pastries, so I could focus on making pretty savory dishes for our lunchtime high tea. 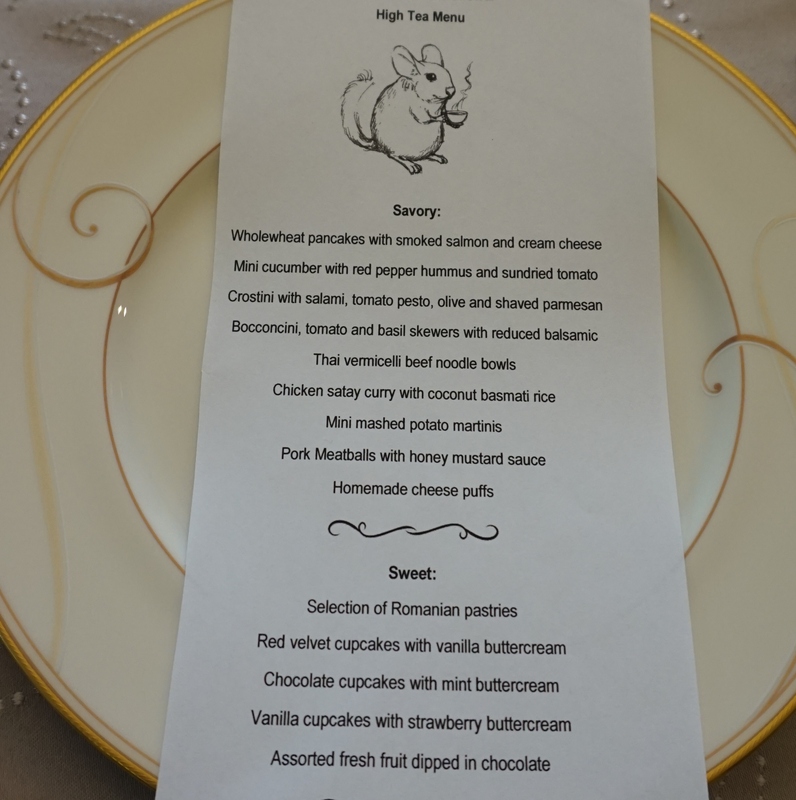 One thing I wanted to make sure with this meal, unlike some other events I host, is that I would get to sit down for the whole time and not be still cooking anything. This meant a lot of preparation the night before and to make things even easier, apart from a chicken satay on rice and some pork meatballs, I made the majority of the remaining dishes cold instead of hot. The Thai noodle bowls were great for this because though they were teeny tiny portions, they were quite filling and helped make it more of a meal. Now I have to say, there’s something satisfying about waking up the day that I’m hosting something and just peeling off the plastic wrap on already prepared dishes! I was able to assemble bocconcini, tomato and basil skewers the night before and all they needed before serving was a drizzle of balsamic. The little olive crostinis were done the day before as well; I placed the salami down before the pesto to ensure I had no soggy bread! 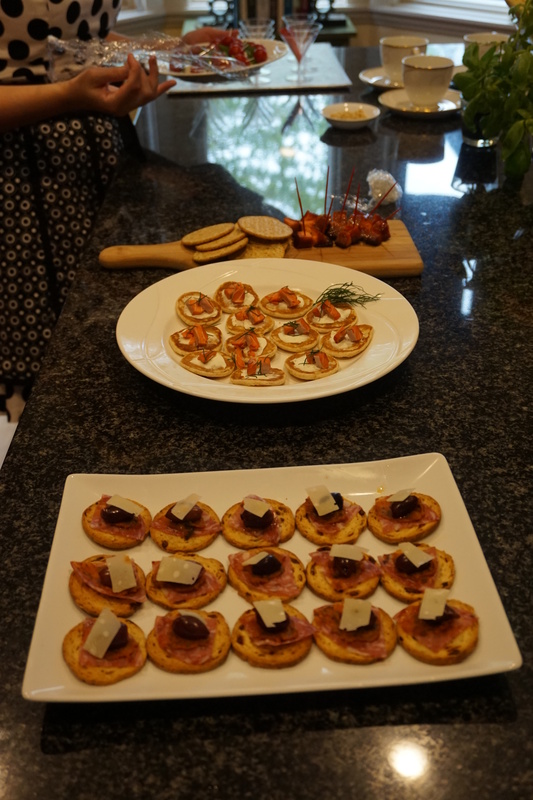 Might I add that both these appetizers require ZERO cooking skill, so literally anyone could prepare these for a party! My parents came from Vancouver Island for the wedding and my dad picked up some beautiful smoked salmon for my whole wheat pancakes (they’re actually called Blinis, but I didn’t want to confuse my guests). Blini’s are another super simple thing to make, there are lots of recipes online, they just look so darn cute, and you can top them with whatever you like! He also brought a candied variety that I served plain with crackers, no sense messing with a good thing. 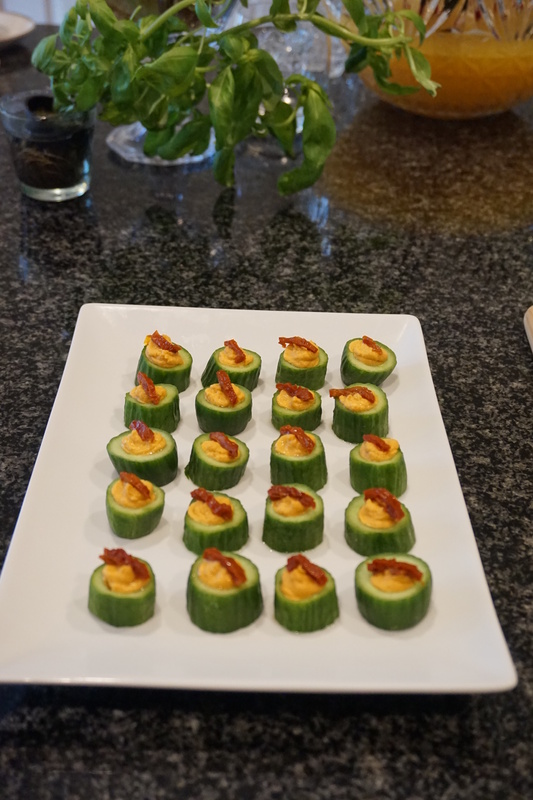 Mini cucumbers are in season right now so I couldn’t resist making one of my favorite tiny appetizers. I slice the cucumbers about an inch apart, hollow out halfway with a small teaspoon, pipe in some hummus and top with a bit of sun-dried tomato. I made my roast red pepper hummus to fill them, but if you just get store bought, this becomes an appetizer you can prep in a matter of minutes. If you are making the night before like I did, ensure you flip the hollowed out cucumbers onto a paper towel and let them sit a few minutes to dry out, so they don’t get watery. Now, this last appetizer I wish I could say I thought of, but it was an offering at an event I had hired catering for about a year ago; except the martini glasses were actual size. 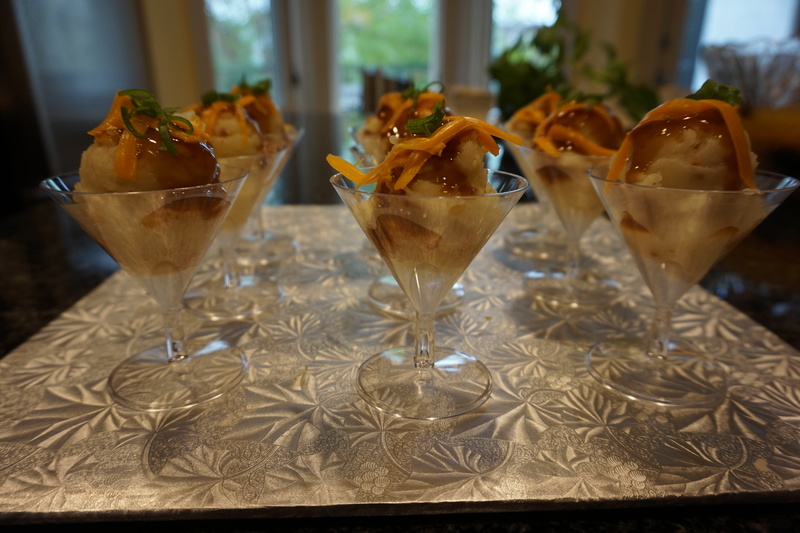 These bacon mashed potato martinis were just a couple of bites each, and they looked pretty adorable! I had a blast prepping everything for this Bridal Shower, was happy with how it all came together and thanks to my day before preparation, I even got to sit down and enjoy it! Congratulations are in order too, as their beautiful wedding was this weekend!